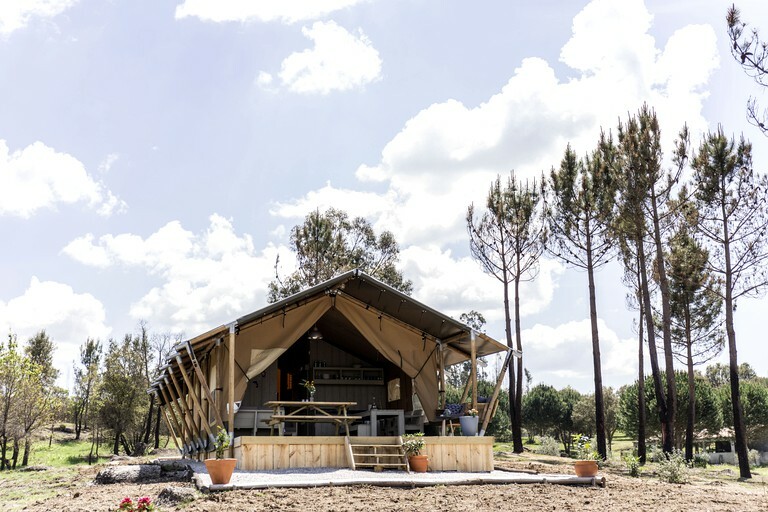 Guests can enjoy a completely unique getaway when staying in this safari tent located near the charming town of Luso in Portugal. 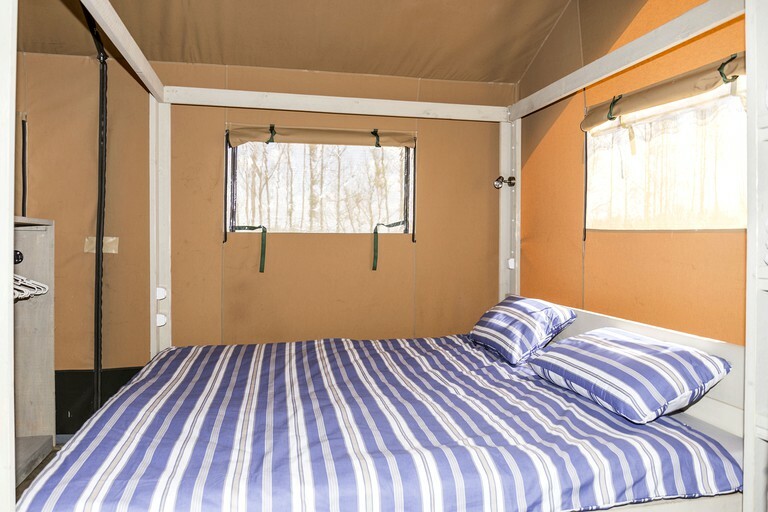 This rental can accommodate up to eight glampers, which is ideal for a family holiday or a group escape for all to enjoy. 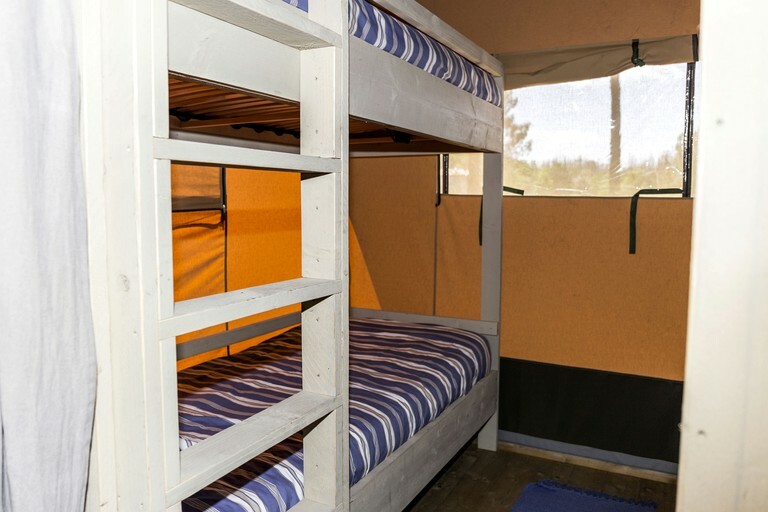 There are two bedrooms in the rental, one with a four-poster double bed and the other with two bunk beds. 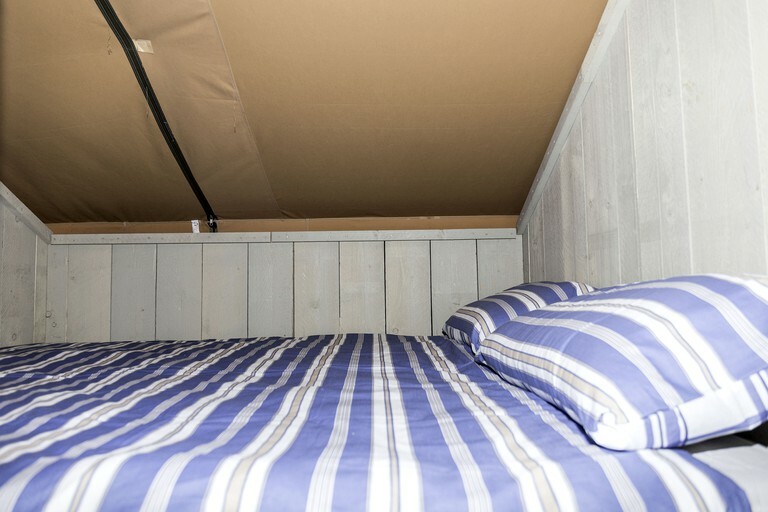 There is also a double cupboard bed. 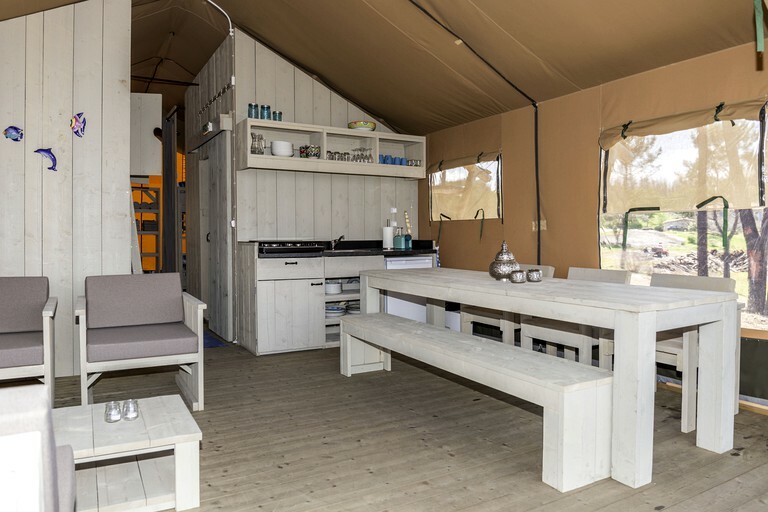 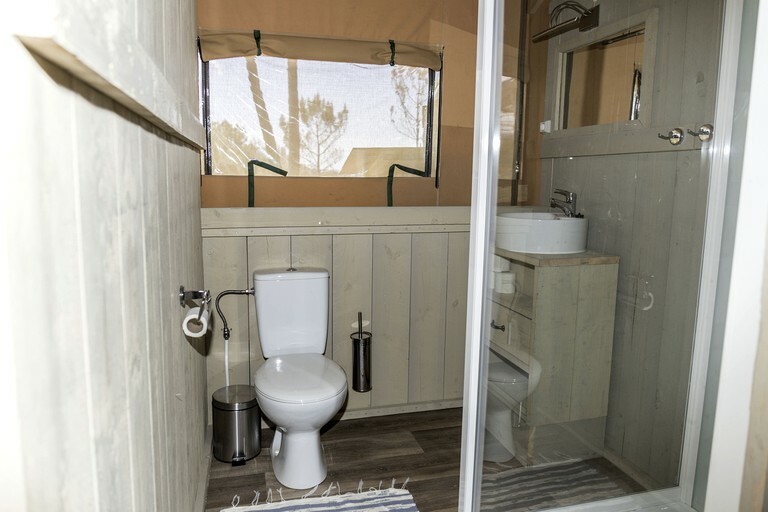 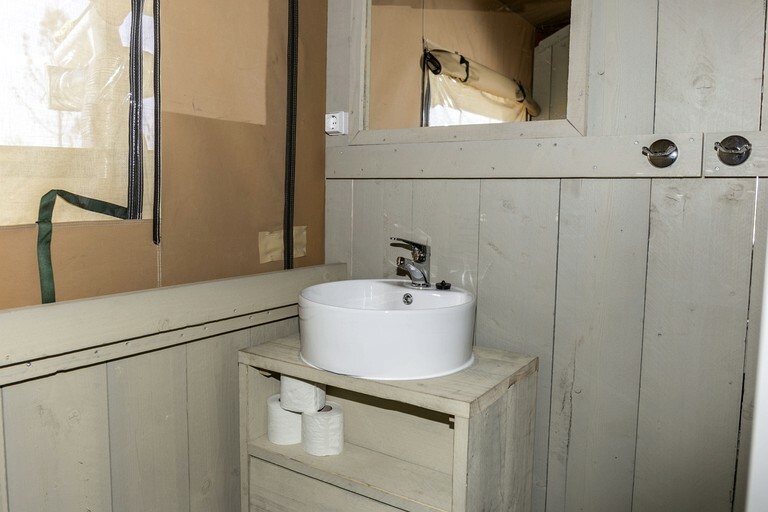 The safari tent has a modern touch to it with a private bathroom that has a toilet, a sink, and a shower. 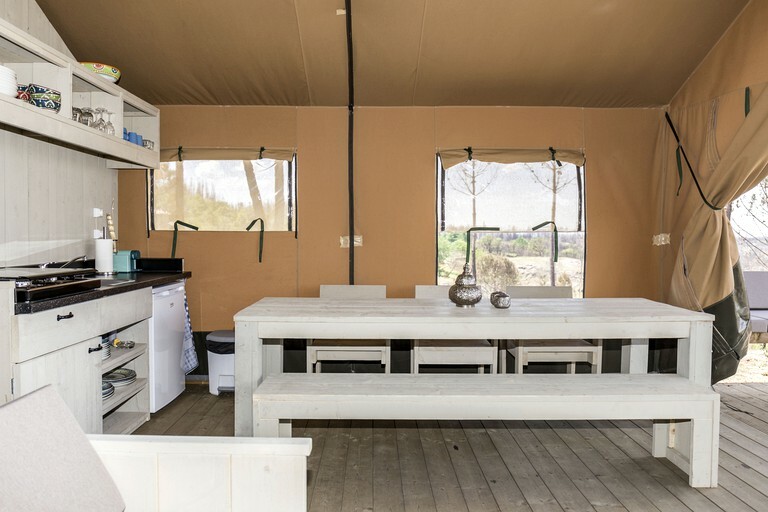 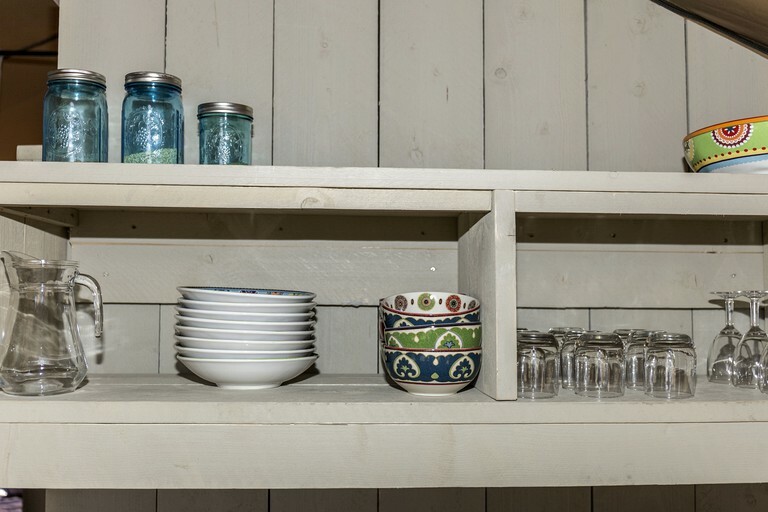 There is a fully-equipped kitchen that features a stove and a sink, as well as a six-person dining table which opens up on the private deck area. 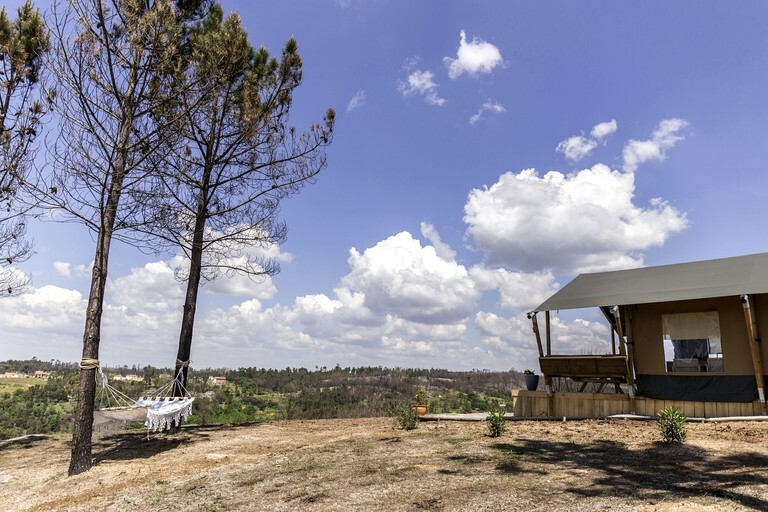 There is a communal swimming pool for all guests and there are sun loungers that surround it so glampers can sit back with a cold beverage and soak in the glorious Portuguese sunshine. 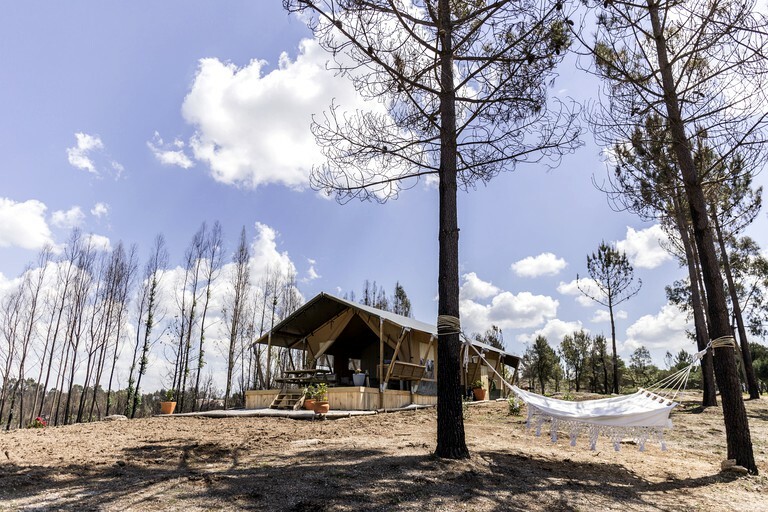 There is another large lounge area beside the pool for those who would like to escape the sun for a little while, as well as hammocks for glampers to enjoy an afternoon nap or a good book. 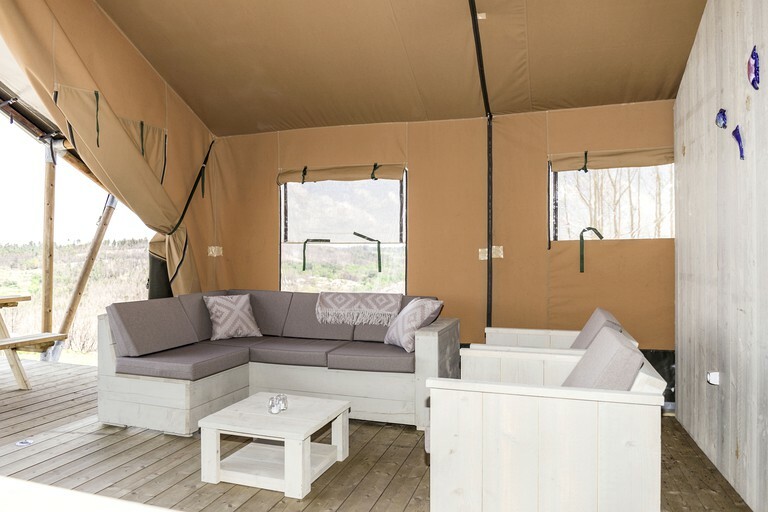 The safari tent is furnished with linens and towels and will be cleaned daily to ensure not only a comfortable stay but a luxurious vacation. 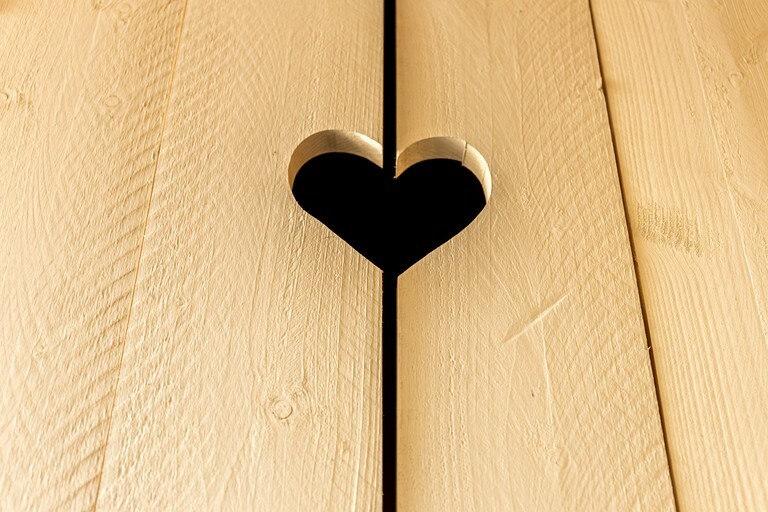 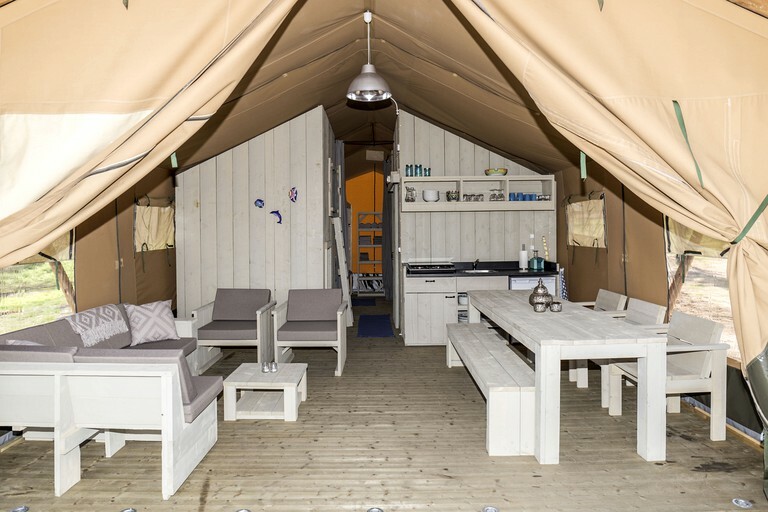 There is Wi-Fi in the accommodation as well as around the glamping site. 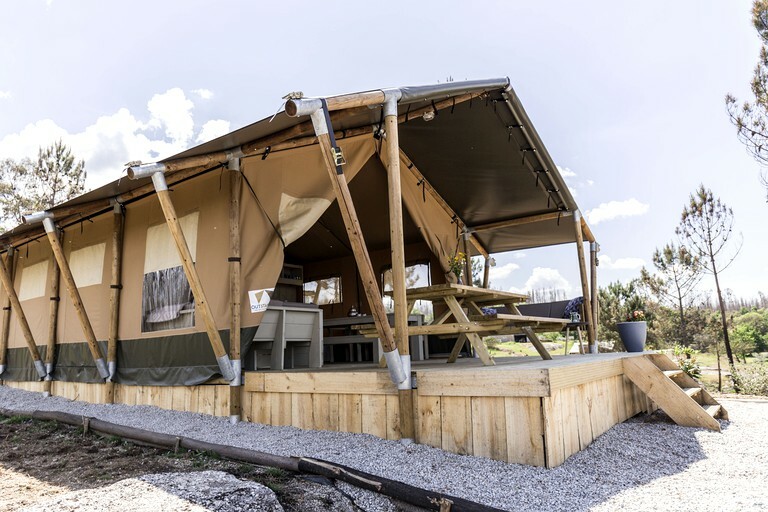 A breakfast delivery service is available each morning to the safari tent to guests for a small added fee and includes delightful local products like freshly grown fruit and fresh eggs, as well as a beverage of choice. 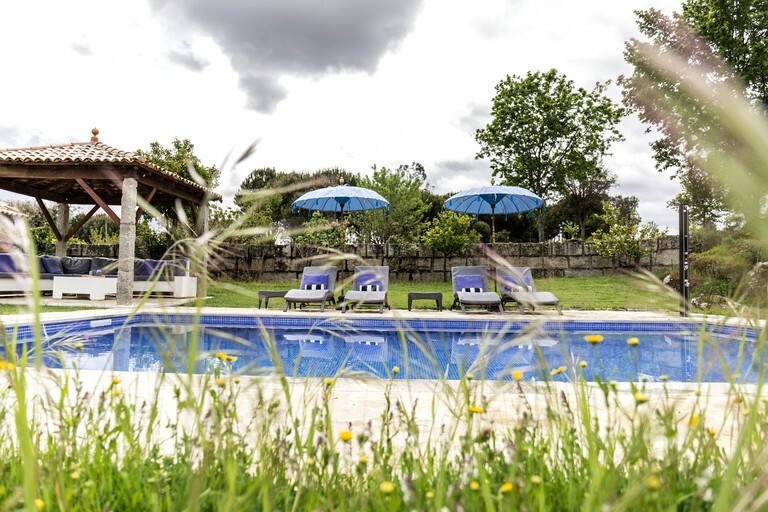 This unique rental is situated in the central region of the Coimbra District of Portugal in a small village called Sinde. 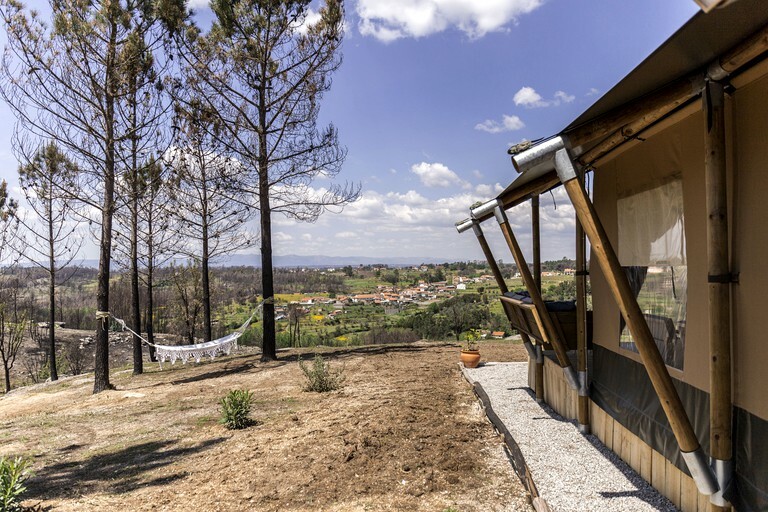 Guests will be roughly 15 minutes from the Mondego River, which is Portugal's largest river. 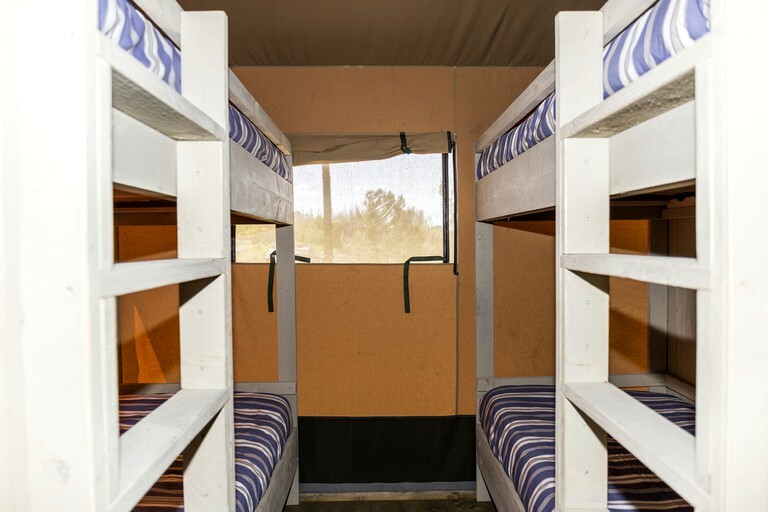 There are a number of activities that glampers can do in the river including fishing, swimming, and kayaking. 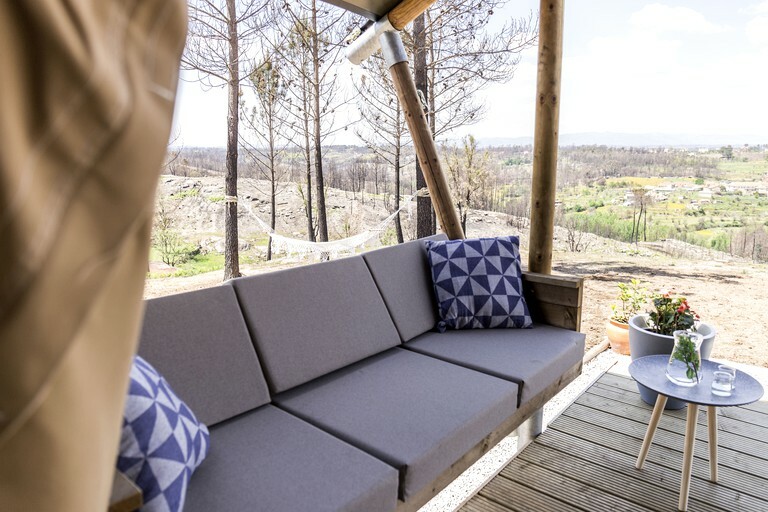 Guests will find the area in which this rental lies to be very secluded and nestled in plenty of woodland and greenery with fields of grass and beautiful natural landscapes in the distance. 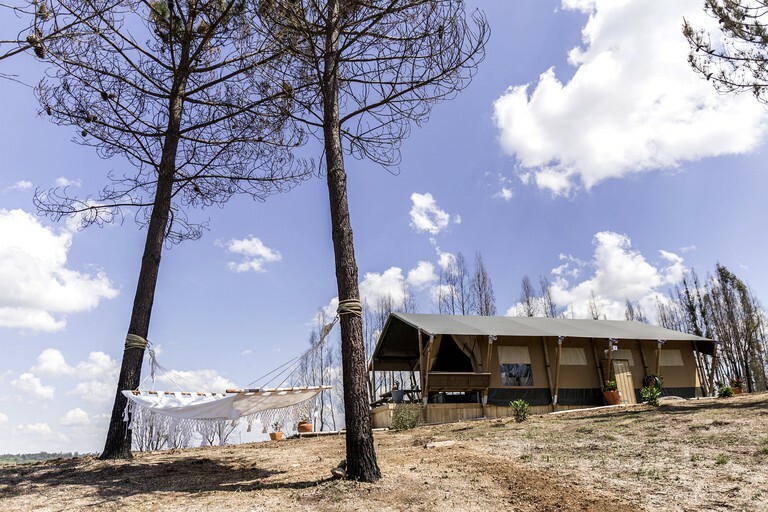 The Serra da Estrela Natural Park is roughly an hour and 15 minutes drive from the rental and boasts many attractions for glampers to see and do. 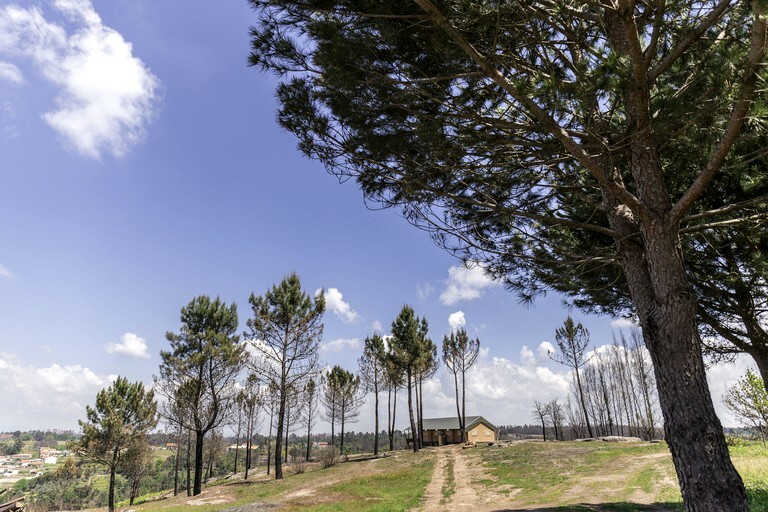 It is located in the largest mountain range in Portugal and offers fascinating culture, nature, and history, which is sure to enlighten all ages. 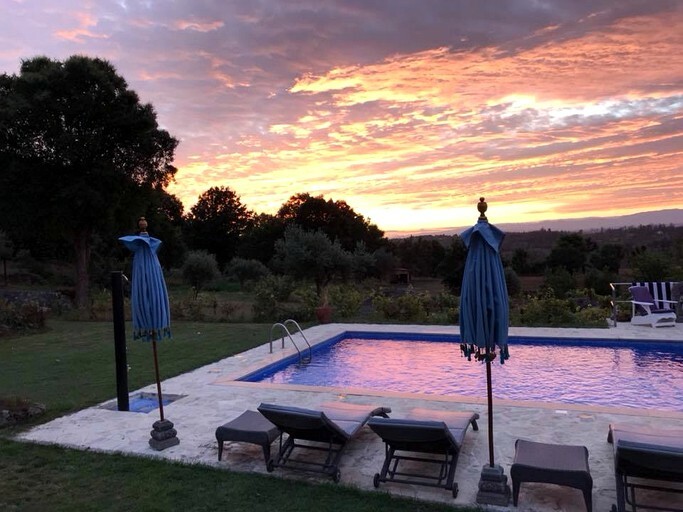 The town of Tábua is just 15 minutes from the rental and is filled with historical architecture and lovely streets and buildings for guests to spend the day strolling through. 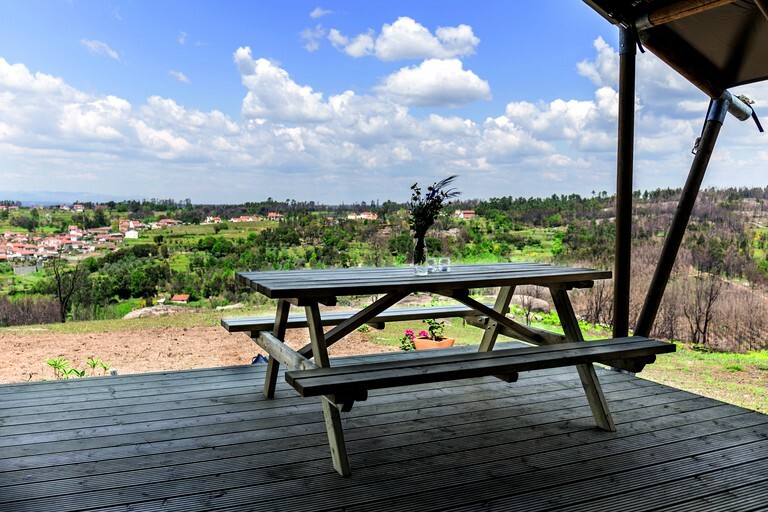 As this rental is located on a farm, the opportunities for activities and adventures can go on and on. 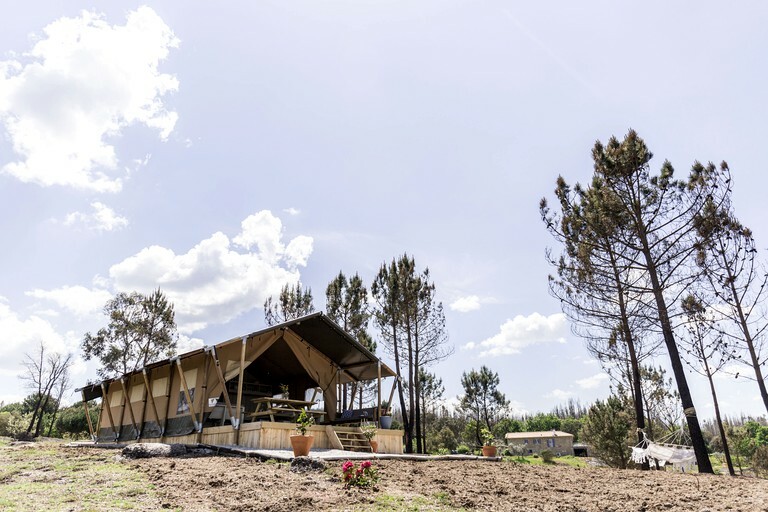 The glamping site is surrounded by robust nature with the stunning Serra Da Estrela in very close proximity. 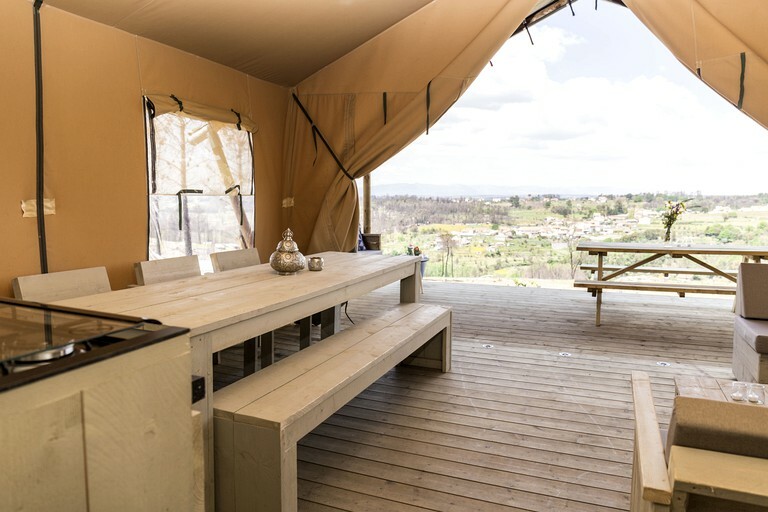 Glampers can spend their stays strolling around the area and truly appreciate the beauty that surrounds them, admiring the views of the valleys, mountains, and rock formations. 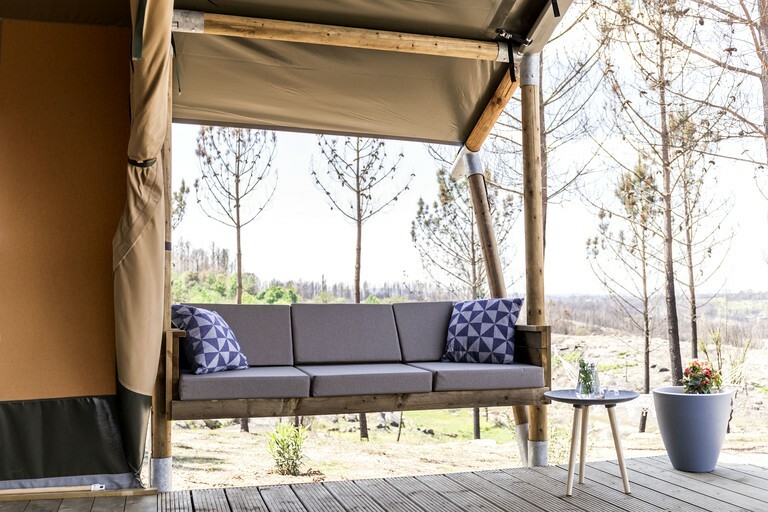 Glampers can also enjoy a spot of paddling on the Mondego River as it features one of the country's most famous canoe descents. 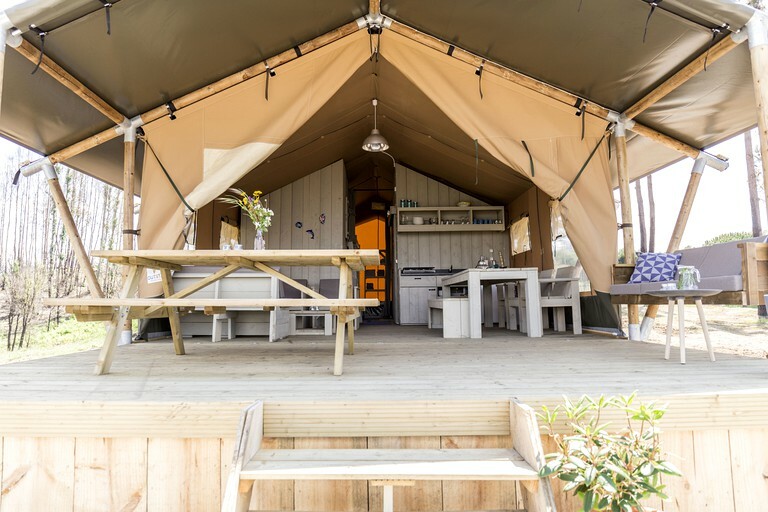 There is a 'cuddle farm' on the glamping site with a rescue donkey, two pigs, chickens, goats, and rabbits so glampers can spend a few hours of their stay petting and feeding the four-legged residents. 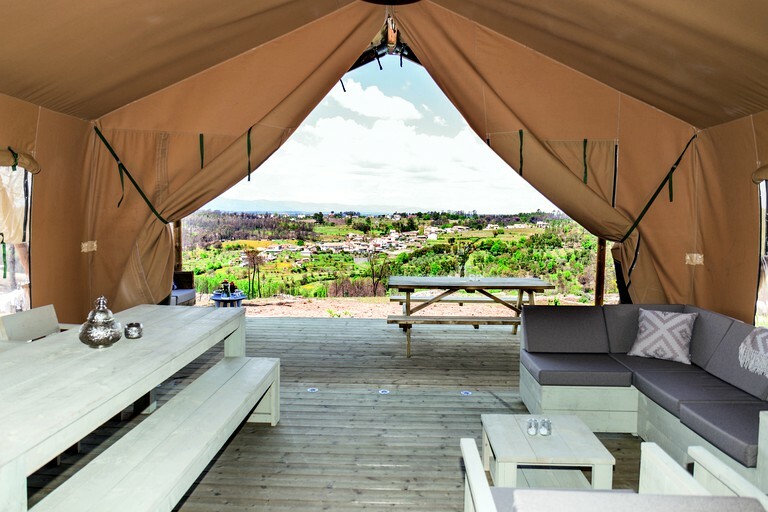 Children will absolutely adore this glamping site with all the space they have to roam around, get dirty, and play on the farm grounds, and of course, cuddling the animals. 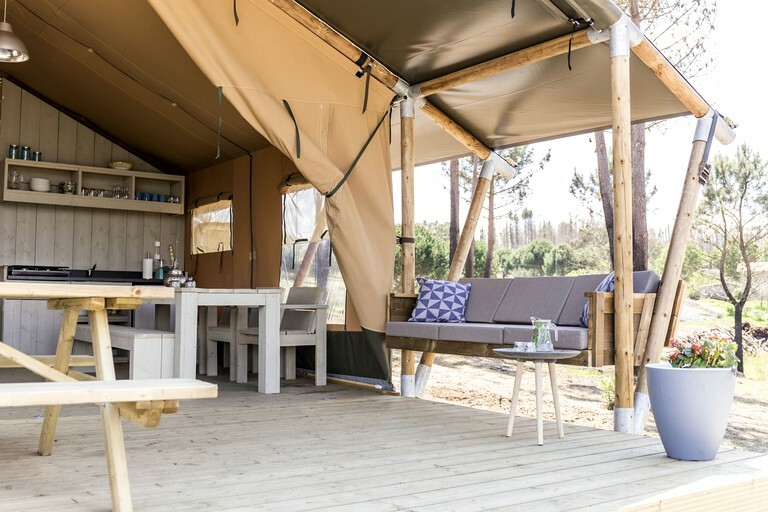 Glampers can choose to explore the surrounding area more and visit local cities and towns that are bursting with culture, history, and beauty. 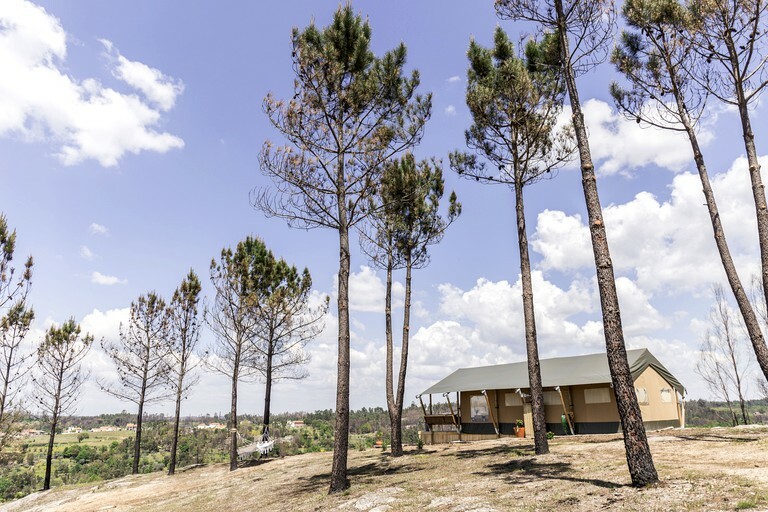 Porto is just under two hours away from the glamping site and there, guests can visit Douro, a beautiful vineyard on a river, as well as visiting the Dom Luís Bridge, the São Bento Railway Station, and plenty of beautiful churches and buildings. 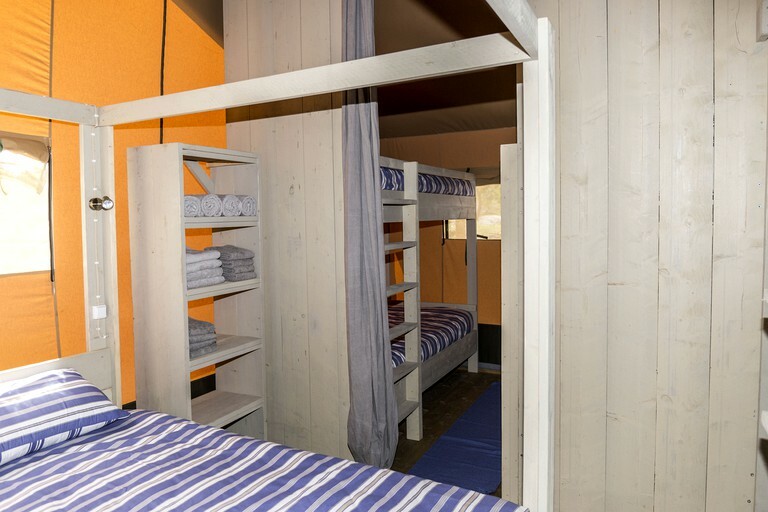 Discounts can be offered for week-long stays. 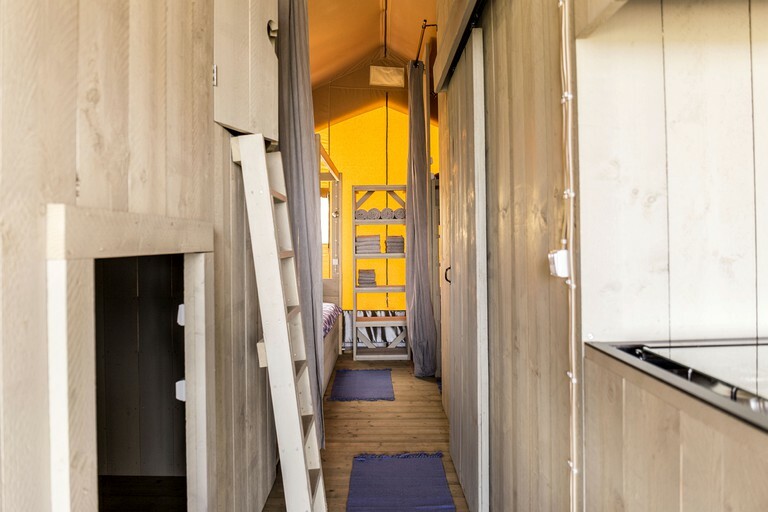 There is a three-night minimum stay.